The King is caught up in wars and couldn't care less about the welfare of his Kingdom. The Princess takes over and worries about the citizens, but she needs the help of a famous builder and treasurer, as you are! Crumbling shacks, dirty streets, lack of food; neighboring kingdoms of dwarves and elves are asking for help, too. The young Princess could not cope with all these matters alone. Help her and write your name in the history of the magic Kingdom! 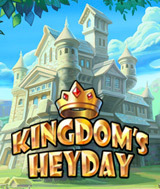 A game for those who are tired of regular city-building games, Kingdom's Heyday is the perfect game for enthusiastic and creative city builders, who believe in magic and miracles. Unexpected turns of events will bring a lot of exciting moments, so be on the lookout! Now go ahead and take the ruling power in your hands.